So Windows 7 is here and receiving both critical and public acclaim, but how does the well received Microsoft OS compare to its previous incarnations? If you are curious then, luckily for you, PC Plus has trawled through its extensive back-catalogue and plucked out previous reviews of Windows and put them online in Flash for your perusal. "My first Windows was 3.0, although before that, I had good old GEM," says PC Plus' Richard Cobbett. "At the time, Windows was interesting just for the wonderful coloured floppy disks, never mind being the future of computing. "Still, as it developed, PC Plus was there at every stage. We've plundered our archives to see what we said about the biggest moments in Windows history, from Windows 3.0 to Windows ME (one of the reviews we don't exactly stand by, but everyone makes mistakes, right? Right? Windows 7 is great, honest...)." 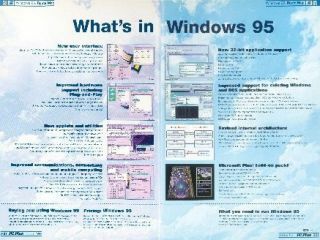 You can comb through and find out exactly what PC Plus thought about Windows 95 at http://pcplus.techradar.com/node/3140 and see if the Windows hype has lived through the ages.